For the last few years I’ve used a folding table, bricks and a piece of light shelving for a make-shift ham radio desk. I finally decided that I needed something that was a little more permanent and a lot sturdier. After searching for commercially available alternatives and being less than thrilled by what I found, I decided to build my own desk. That presented a bit of a problem as I am hardly the master woodworker. So, I was left with finding an “easy” alternative that provided the two essentials I was looking for: a lot of surface space and a raised shelf that covered the entire back of the desk. I also wanted to make sure that this desk could handle the weight of large and heavy pieces of ham gear. After much searching and thinking, I finally arrived at a solution. 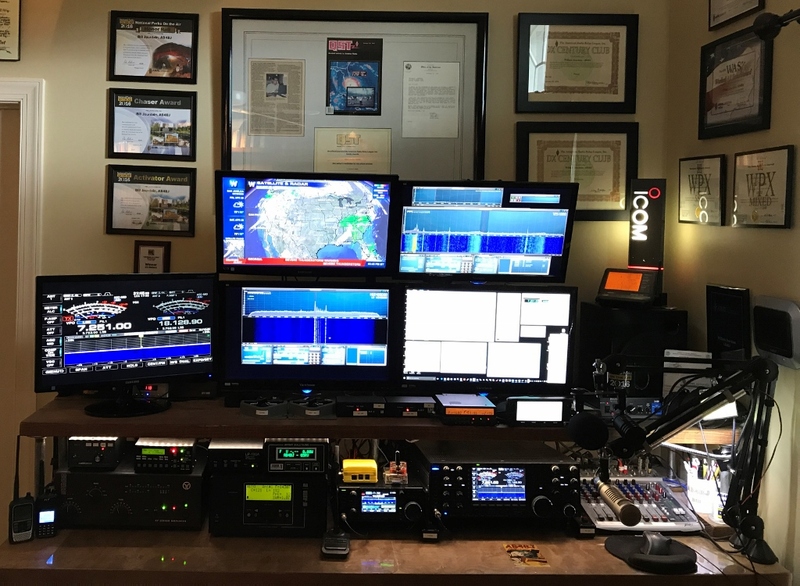 While not inexpensive, it has left me with a perfect desk for my ham radio needs. Here’s what I did. My journey started at the local Home Depot where I purchased a solid core door, measuring 32 inches wide by 80 inches long. This solid door is 2 inches thick and VERY heavy. For the raised shelf, I bought a nice long piece of pine board measuring 11 inches wide and 1 3/4 inches thick. This is all very sturdy stuff, but the real dilemma was how to build it into a functional – and safe – desk. The solution presented itself in the form of galvanized conduit with threaded ends. I purchased several lengths of 1 1/2 inch diameter pipe for the legs, and five pre-cut 8 inch long and threaded 3/4 inch diameter galvanized connectors for the risers for the shelves. The expensive part of the project was buying the threaded flanges to connect to the legs and risers for the shelf. The large flanges are secured to the underside of the desk to attach the legs. The smaller flanges are attached to the top of the desk and bottom of the shelf to attach the risers for the shelf. I used stainless steel wood screws to secure the flanges to the wood. This was a LOT of screws (60 in all)! But the biggest dilemma was how to get the legs cut and threaded? I don’t have the equipment to do this and was not sure how to proceed. I knew I wanted the desktop to be 30 inches high (I had a two drawer file cabinet that I wanted to just fit under the bottom of the desk and a keyboard drawer to be mounted to the bottom of the desk) but no way to create the legs from the pipe. Home Depot came to the rescue when they told me that for no charge they would cut and thread the pipe to my specs! I was thrilled and about two hours later I was home with five large cut and threaded legs. They also cut my shelf board for me, even though that’s one part of this project I could have done. The only downside to the pipe is that a lot of oil was used for lubrication while they cut and threaded the pipe. Needless to say, this was a bit of a mess that had to be dealt with along with removing some sticky labels on the pipe used for the risers. I scrubbed each pipe (including the risers for the shelf) with a rag drenched in WD40 to remove the gummy labels. My wonderful wife then washed each of the pipes with hot water and soap. They were as good as new! After all of the parts were ready (and dry! ), I decided to first stain the shelving and table top. I selected Minwax Early American stain and gave all of the exposed surfaces several coats. After the stain was good and dry it was time for assembly of the desk! I mentioned above how heavy this door/table top is. My ham shack is upstairs in our house and I doubted my wife and I would be able to carry the finished desk up the stairs from our garage. So, I attached the flanges to the bottom of the desk in the garage and we then carried the desktop up the stairs to the shack. We brought the rest of the pieces upstairs and assembled the desk in the shack. This amounted to screwing the legs into the flanges on the bottom of the desktop and screwing a flange on the bottom of each leg to make a “foot”. I then screwed the smaller flanges to the bottom of the shelf and screwed the riser pipe into each. Next, I screwed the bottom flange to the riser pipe and placed the shelf with attached risers and flanges in place on the desktop. It was then easy to screw the shelf down to the desktop by securing the bottom small flanges with screws (Note: I drilled a small pilot hole for each screw. This made the wood screws go in much more smoothly). The final touches included mounting the Office Depot keyboard drawer and purchasing two large clear desk pads to protect the wood top. I then spent about four hours putting all of the equipment back in place, running wires, etc. Here’s a photo of me and Wally the Wonder Dog admiring our work before the equipment was put in place (click on the photo for a larger version). Note that I placed a fifth leg in the center of the table top and a fifth riser at the front of the shelf for extra support. 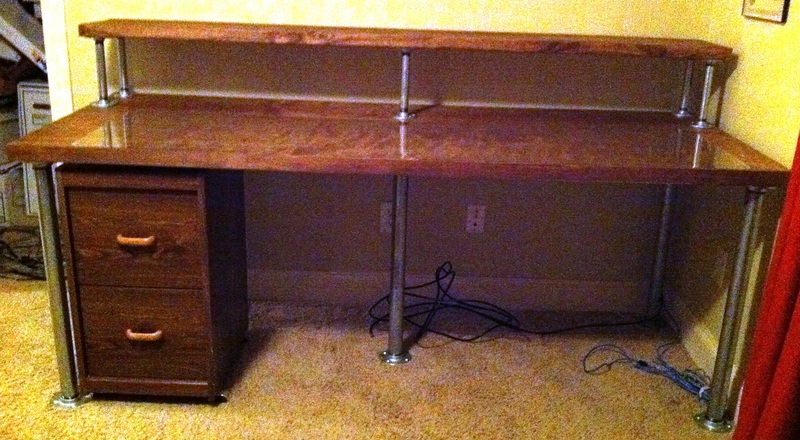 Here’s a photo of the completed desk from the front (sorry about the fair quality photo). 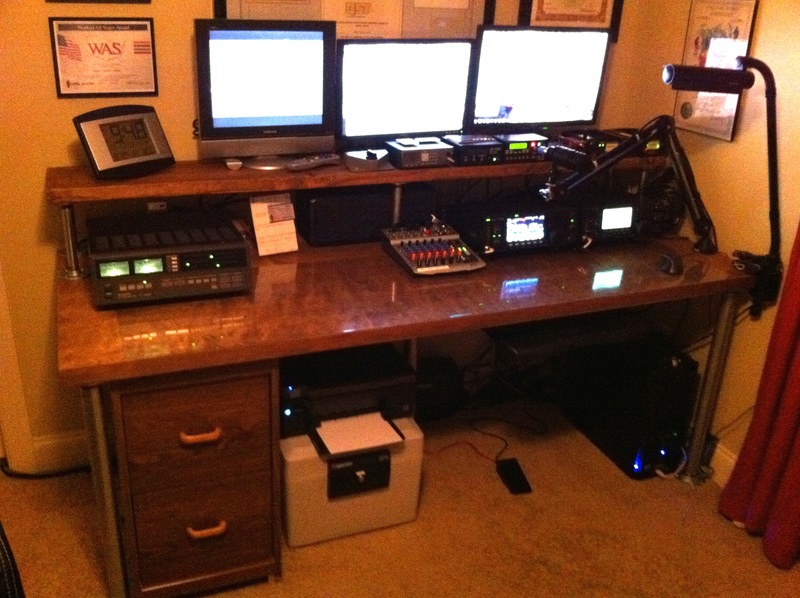 Finally, here’s the desk with the equipment replaced. I will add a link in the near future to show the current station, as some of this equipment has been replaced. Update: Here’s the current configuration. 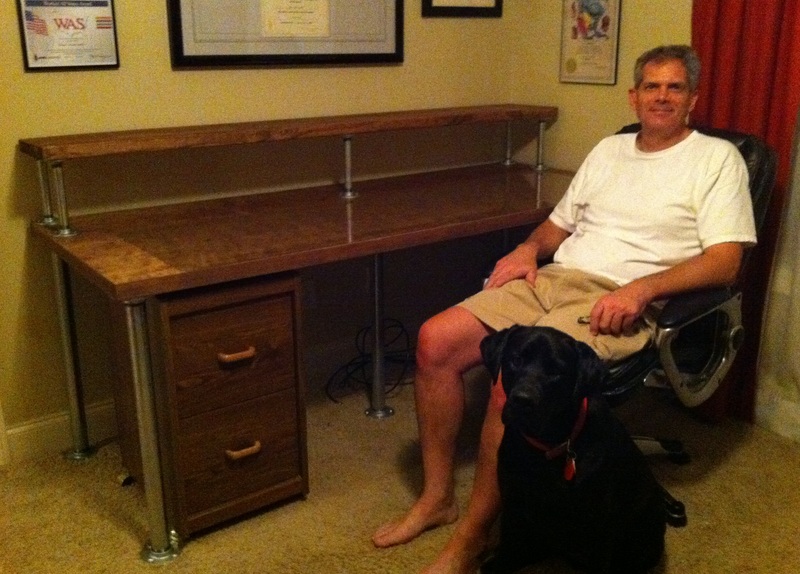 This was a fun and enjoyable project that resulted in a new desk that is sturdy and functional. Not only will this desk last a lifetime, but I bet you could hold a square dance on it! In hindsight, I wish I had made the shelf about an inch or so higher, but that’s not really a big deal. I’m considering adding another shelf or half-shelf, but that’s for another day. Now, on to the next project! This entry was posted in Uncategorized and tagged Ham Radio Desk. Bookmark the permalink. This is great! I am buying the parts tomorrow, at my local Lowes. Thanks for posting. Would be happy to hear of anything you would do differently today. After using this desk for a while, I realized that I needed a larger top shelf. Instead of removing the old shelf and adding a new larger one, I simply added a second shelf identical to the existing one, spaced about an inch apart from the original shelf. The one inch space is designed to allow wires and cables to pass through. I will update this post in the near future with photos and a longer explanation of the new set up. The only other thing I would change is to have better access for wires and cables at the back of the desk. Despite this small issue, I continue to love this desk and find it perfect for my needs. The latest update to the top of the desk. An additional shelf is now added in front of the original, with an inch between them. And a side view showing the added second shelf and new under-shelf lighting. Bill where did you get the flanges for desk project and what size’s ??? The flanges came from Home Depot. They have all sizes depending on the diameter of the pipe you are using for your desk or shelf. Did you do anything to the edges of the door? Curious if you left it alone or added laminate to it.. I did not do anything to the edges of the door other than stain them along with the rest of the desk top. Love this creative idea for adding a shelf to my existing desk. I wonder if you considered having the shelf flanges attach to a 1×3 or 1×4 both top and bottom to act as the flange mount and increase the shelf height. Your article gives me a new reason to visit the home supply stores! really like your desk project. in the article it states you used 1 1/2 inch pipe for the legs but its unclear on the length other than to say you wanted the desk to be 30 inches to clear your file cabinet. so the legs were cut at 30 inches? The legs were cut at 29 inches. but with the flanges attached to each end the bottom of the desk sits just above the top of the cabinet, close to 30 inches. The flanges are adjustable, so you can tweak the height of the desk by slightly moving them up or down. My desk was really created more by “look and feel”. I knew I had the file cabinet to go under the top of the desk, and also knew I had a under-desk keyboard drawer to attach. Because of these two features I wanted to include, the desk was built after a lot of measuring and re-measuring to make sure everything would fit. So, there is really no magic to the 30 inch number. You should build it at a height that is comfortable to you and the way you will use it. Also keep in mind that I am 6′ 4″, so some might want it a bit shorter then I made mine, assuming everything will fit under it they way they need it to. I really enjoyed your project. I’m doing the same thing but I’m using PVC parts. As I have been in the process of re-building my station, I have also decided to move it into the loft of a recently renovated barn. I have been fretting over how to build a really functional, multi-tiered desk since space will NOT be an issue. I love the idea. Thanks for sharing. Curious about the (approximate) cost of the project, too. Bill, what did you use for the under desk lighting? That’s hard to say as I’ve modified it over the years. Ballpark figure is probably $500 to $600. It’s a standard LED strip light kit from Home Depot. I was considering using pipe and fittings for a furniture project and gasped when I learned what the floor flanges cost—I would be needing quite a few. For anyone else considering this route, check your local plumbing supply shop. They typical sell the flanges (and all the other fittings) for about 1/2 what the big box stores charge. 73! If you like the idea, want more options, and have money to burn, here’s an option for the legs. https://www.simplifiedbuilding.com/store/table-frame-kit-basic.html As for me, I’m duplicating the original. If found that not all floor flanges are created equal, in that some are not even close to being perpendicular to the floor. Not so significant on the shorter runs, but at 29 inches apart, yes. Save your receipt. Love this project! Looks great as well! Curious as to how you mounted your quad monitors? Did you custom make the mounts for that as well or was it a pre-fabbed monitor mount? Tim – The quad monitor mount was purchased from Amazon. It’s a pretty standard mount designed to attach up to four monitors. There are many variations on Amazon. This particular mount attaches to the top of the desk with a large clamp that’s built in. It has been very sturdy. The monitors also swivel, which is convenient when I need to work behind them. Greg – Thanks for posting the link to the “simplified building” kit. The only feature of their design I don’t like is the cross brace along the bottom. I spend a lot of time under my desk running wires, making changes, etc., and I think that cross piece would get in the way and be a source of aggravation. Other than that, this is a nice kit and would serve the same purpose of my design.